2016, our second full year in existence, was a year of stabilization in which we further solidified our identity as an organization and our presence in the community. I am pleased to report on our continued presence as a community support program for LGBT refugees and immigrants from Latin America. First, a word about the founding of OLAS and the population we are serving. In 2015, our first full year in existence, we raised enough funds (through tax-deductible donations grants, and a fundraiser) to offer three group retreats. In 2016, we not only offered three group retreats, but also three one-day events. Two of these one-day events were for our regular program participants. Another was exclusively for the Brazilian, Portuguese-speaking LGBT immigrant community. Also, unlike in 2015, our 2016 fundraiser was MC’d by a participant and about 10 participants were in attendance. In this wonderful year, we made a difference in the lives of LGBT immigrants from Mexico, El Salvador, Honduras, Guatemala, Peru, Nicaragua and Columbia. Here are some of our accomplishments. We also implemented three one-day events with a total of 33 participants. One of these events was for the Brazilian, Portuguese-speaking LGBT immigrant community. As a result, we now have all of our major documents translated into Portuguese. We supported our participants through two very stressful events, the Orlando shooting in June and the Presidential election in November. These events were addressed at OLAS gatherings, and we used our confidential Facebook group as a forum for sharing feelings and words of support / encouragement. We hired a Brazilian therapist and attempted to reach out to the Brazilian, Portuguese-speaking LGBT community, offering a one day program. We improved our logo to be more versatile, while maintaining the basic design of our former logo. Melanie DeMore, a well-known local singer/songwriter, honored us, for the second consecutive year, by being the headliner at our 2016 fundraiser. Another participant opened for her. Yet another participant served as MC of the entire event. Our actual expenditures in 2016 totaled $10,183.91. When in-kind donations are factored in, our expenditures total $14,353.91. In 2016, our actual expenditures were $10,183.91. We also received $4970 in in-kind donations, bringing the total costs to $14, 353.91. Our 2017 projected expenses are very similar. Since we can’t depend on in-kind donations, we have folded those costs into the projected expenses, for a total projected budget of $14,897. In addition, we received a few large donations in 2016 that are not expected to repeat in 2017. Therefore, our projected income in 2017 is lower than our 2016 income. 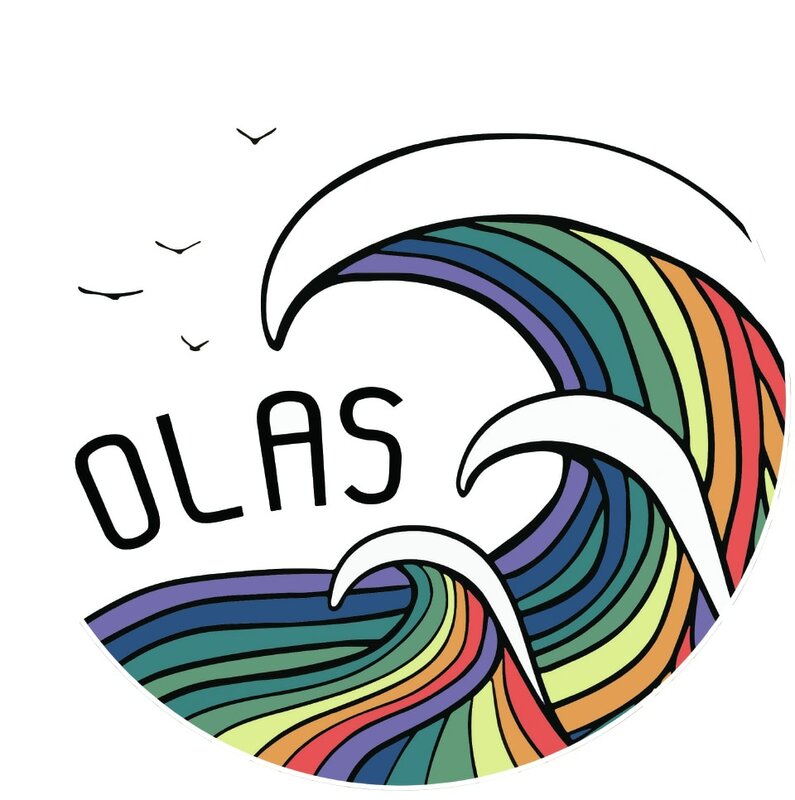 The OLAS Advisory Committee is composed of experts from various professions and backgrounds who join our efforts in making a difference in the lives of LGBT immigrants. They help guide OLAS’s vision and offer practical suggestions for improving and advancing the program. These stakeholders meet in person three times per year and offer consultation and assistance as needed throughout the year. Aaron Testard, LMFT, LPCC: Aaron Testard is the Director of Clinical Services at the Pacific Center for Human Growth and a psychotherapist in private practice in Berkeley. He has a 10-year history of non-profit program management and development, and his clinical specialties include sexual and gender identity, addiction, HIV, and felon re-entry. He has previously worked as a substance abuse counselor at Acceptance Place, a child and family therapist at Sunny Hills Services, and a group therapist at Jewish Home for the Aged. Adela Pedroza, MBA: Adela is a full-time Consultant with Kaiser Permanente Market Research in Oakland, CA, where she assists senior health care leaders in making business decisions. Adela has over 8 years of market research and marketing experience. She holds an MBA in Marketing from University of Arizona and a BA from Vassar College, and did graduate studies in international marketing in Mexico. Carolina Abolio, BA: Carolina is a Venezuelan photographer, based in Oakland, CA. In her work you can see the mix of her strong Caribbean roots and the magic of diversity that surrounds her every day. Her main goal is to bring awareness to the community about the importance of collaboration, tolerance and respect towards each other, especially in the gay/ Latino communities. She also is a mentor for the East Bay College Fund, supporting low-income college students coming from the Oakland public school system. Chris Tiedemann, Esq. : Chris is an environmental attorney in Oakland. She has volunteered for East Bay immigrant groups for many years and is currently on the Board of Directors of East Bay Sanctuary Covenant. Joy E. Carlson, MPH: Joy Carlson has been active in the non-profit sector for over 40 years, working primarily in the public and environmental health arena. She is currently Principal at J. Carlson Consulting which provides strategic planning, organizational development, program and policy development, and evaluation services to non-profit organizations. Prior to founding J. Carlson Consulting, she was the founding director for the Children’s Environmental Health Network, a national organization dedicated to preventing toxic exposures to children. She has worked at local, state, national and international levels with a broad range of constituencies and sectors. She has a special interest in supporting organizations and staff committed to change. Renée Grevenberg, LCSW: Renee Grevenberg has a small private psychotherapy practice at Kensho Center for Multicultural and Holistic Counseling in Berkeley. She retired in 2011 from the San Francisco Department of Human Services, Child Protective Services, after 23 years of service as a Child Protective Services Worker and Supervisor. She continues to be active in community organizations working for Social Justice. Renee holds a BA from Brooklyn College, CUNY and an MSW from San Francisco State University. OLAS seeks to expand its commitment to its current participants while continuing to invite new participants into the program. For 2017, we will offer 2 weekend retreats (compared to 3 in the previous year), however we will increase our one-day programs from 3 to 4. This change will allow us to reach more people, as our one-day events are consistently better attended. Also, one-day events are considerably easier to organize and less costly than our weekend retreats. In 2016, one of our one-day events was offered exclusively for the Brazilian, Portuguese-speaking LGBT immigrant community. The event was positive but not well-attended, so we will hold off on offering another such event until more outreach can be done in the Brazilian LGBT immigrant community. Therefore, all four of our one-day events in 2017 will be devoted to the Spanish-speaking Latino refugee/immigrant community, as opposed to two last year. OLAS will hire a new Assistant Director in 2017, with the eventual goal of having two co-directors by 2018. Having two co-directors will increase our ability to do outreach, to cooperate with other local organizations, to increase fundraising efforts, and to keep our curriculum fresh and innovative, while staying true to our original mission and values. At the end of 2016, four wonderful members of our Advisory Committee stepped down in order to focus on other family and volunteer commitments. Going forward, the 2017 Advisory Committee will have four new members, in addition to three original members serving their third year on the committee. OLAS would like to thank all the former and current members of the Advisory Committee for their invaluable help. In order to become a sustainable non-profit program , fundraising efforts are currently underway, including crowdfunding campaigns, grants, fundraiser events, and volunteer recruitment. Thanks to our efforts, we begin the 2017 calendar/fiscal year with $26 207.64. We are able to cover our 2017 expenses, with a surplus going into 2018. We plan to continue to operate under the fiscal sponsorship of East Bay Sanctuary Covenant. There are many ways to help us non-monetarily. We sometimes volunteer help in the kitchen during our weekend retreats. We also would benefit from donations of art supplies and decorations. For more information, please contact Diana Shapiro at 510-665-4118 x2. We would like to thank the following people and organizations for their generous contributions. Volunteers/In-Kind Donations: Helen Couture-Rodriguez, Jo Ellen Rodriguez, Sebastian Melo, Rosenda Sandoval, Laura Fannon, Maggie Moore, Kate Munger, Joanne Holland, Scott McPherson, Sylvia Soriano, Lauren Phillips, Margo Leslie, Hector Garcia, Adela Pedroza, Joy Carlson, Carolina Abolio, Aaron Testard, Chris Tiedemann, Renee Grevenberg, Janelle Orsi, Jan Thomas, John Taft, Barbara Gilson, Doris Garrido Serrano, Ruby Barnett, Renee Enteen, La Meditaranee Restaurant, Books Inc, The Contemporary Jewish Museum, The Spanish Table, Rick and Anne’s, Pegasus Books, Shotgun Players, The Marsh, California Academy of Sciences, Chanticleer, Lisa Harbus, The Claremont Hotel, Tacubaya, Half Price Books, Poulet Restaurant, Bette’s Oceanview Diner, The New Parkway theater, Fitness SF, and Spirit Rock Meditation Center. Financial Donations: Sharon Moy, Alan Shapiro, Monica Alexandra, Lyn Fine, East Bay Sanctuary Covenant, Woo Kim, Anna Lijphart. Annie Mitchell, Lisa Temple, Emma Haft, Celenia Delsol, Helen Greenspan, Joan Lohman, , Michael and Alice Smith, and Suzanne Sporri. OLAS would also like to thank those who made their donations anonymously.